Anthocyanins present in fruits and vegetables are receiving increased attention because of their potential antioxidant activity but are very susceptible to degradation during processing and storage. 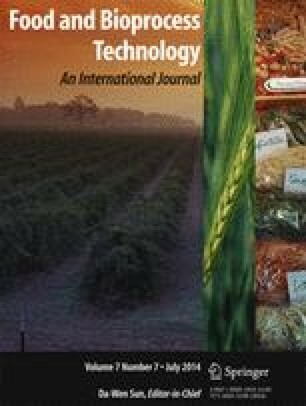 Effect of storage on kinetics of anthocyanin degradation and hydroxymethylfurfural (HMF) formation in black mulberry juice and concentrate was determined during 8 months of storage at temperatures of 5°, 20°, 30°, and 40 °C. The monomeric anthocyanin degradation was in accordance with the first-order reaction kinetics and the activation energies of anthocyanin degradation in black mulberry juice and concentrate were found as 56.48 and 49.75 kJ mol−1, respectively. HMF formation in black mulberry juice and concentrate increased linearly with storage time and temperature and followed zero-order reactions. The activation energies of HMF formation in black mulberry juice and concentrate were found as 75.70 and 104.11 kJ mol−1, respectively. The losses of antioxidant activity for black mulberry juice and concentrate during storage at different temperatures were in the ranges of 4.87–16.01 and 4.47–33.57 %, respectively. Antioxidant activity in black mulberry juice and concentrate was correlated with total monomeric anthocyanins. The authors wish to thank Göknur Foodstuffs Import Export Trading and Production Company (Niğde, Turkey) for preparation of research samples. FAO (2011) Statistical Database. http://faostat.fao.org (accessed 05.06.2013).